Human cells make up only 43% of the body's total cell count. The rest are micro scopic colonists. "That's been refined much closer to one-to-one, so the current estimate is you're about 43% human if you're counting up all the cells," he says. But genetically we're even more outgunned. 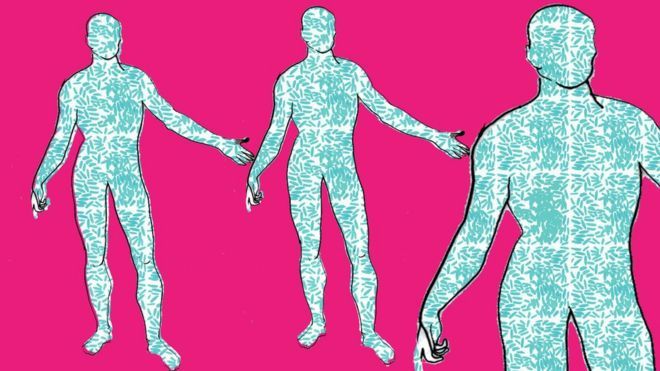 Prof Sarkis Mazmanian, a microbiologist from Caltech, argues: "We don't have just one genome, the genes of our microbiome present essentially a second genome which augment the activity of our own. "What makes us human is, in my opinion, the combination of our own DNA, plus the DNA of our gut microbes." Prof Knight said: "We're finding ways that these tiny creatures totally transform our health in ways we never imagined until recently." That's been a good thing and has saved large numbers of lives. Prof Ley told me: "We have over the past 50 years done a terrific job of eliminating infectious disease. "But we have seen an enormous and terrifying increase in autoimmune disease and in allergy. Prof Knight says: "We were able to show that if you take lean and obese humans and take their faeces and transplant the bacteria into mice you can make the mouse thinner or fatter depending on whose microbiome it got." "This is pretty amazing right, but the question now is will this be translatable to humans"
This is the big hope for the field, that microbes could be a new form of medicine. It is known as using "bugs as drugs". "In a diseased state there could be bugs missing, for example, the concept is to reintroduce those." Dr Lawley says there's growing evidence that repairing someone's microbiome "can actually lead to remission" in diseases such as ulcerative colitis, a type of inflammatory bowel disease.